I followed the girl from behind but then she suddenly disappeared from my view. Where did she go? I looked to my right and left but could not find her. Maybe she's a ghost? Who knows? But that did not really matter for what was ahead of me looked more interesting. I realized I was on another bridge. 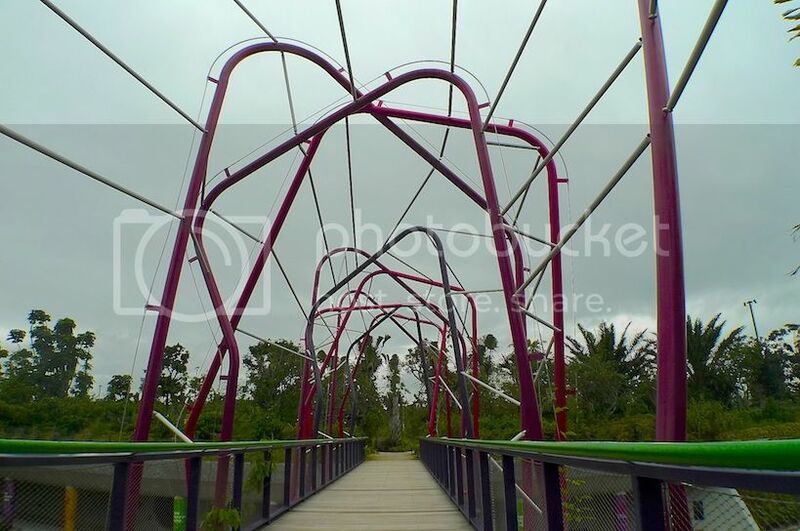 This bridge has an amazing design. 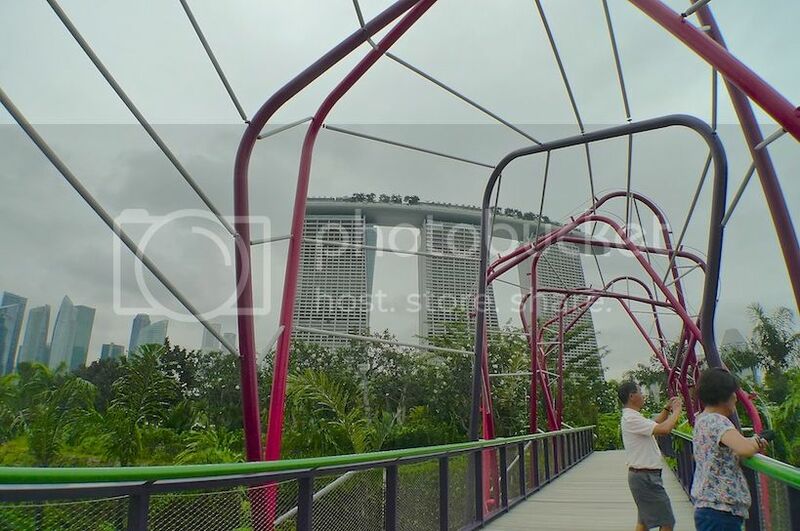 I thought it looked beautiful against Marina Bay Sands in the background! Could not resist taking more shots of this unique bridge. LOL! Such gloomy weather but it was breezy and cool - perfect for a walk in the outdoors! 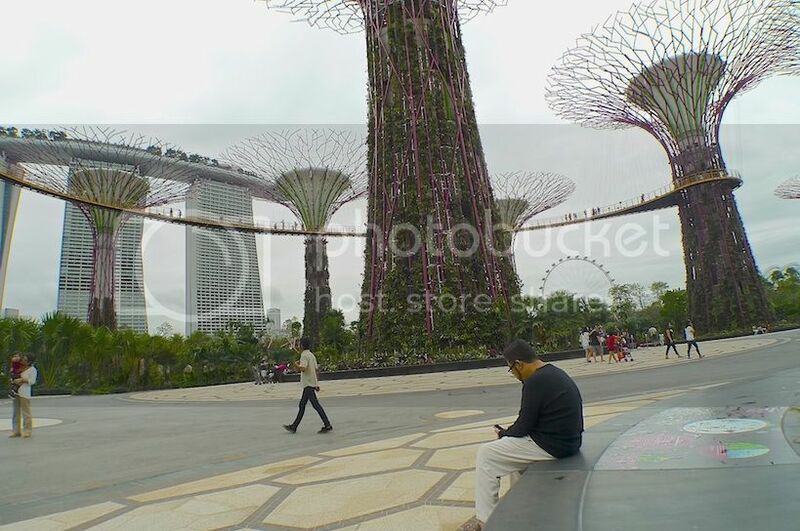 That's the Supertrees on the right side. 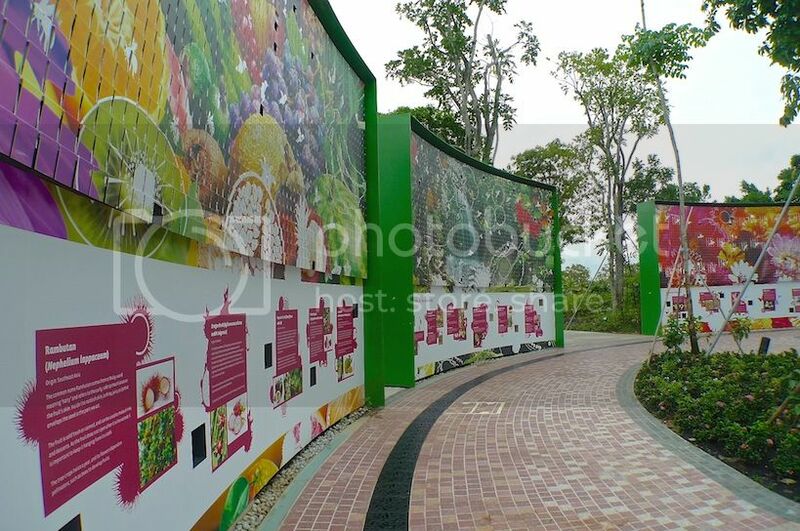 Then I came to an area called Fruits and Flowers which had interesting information about well, fruits and flowers! Again, I did not read every single information on display - that would have taken too much time! 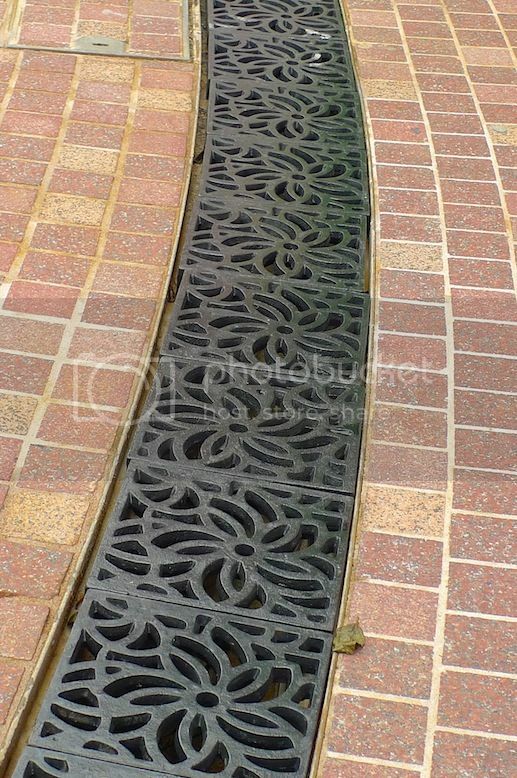 Somehow, I was attracted to the beautiful drain cover. LOL! At that moment, a Garden Cruiser passed by. OK, I am going to ride on that Garden Cruiser the next time I visit here! Haha! Wonder if my friend Jim was on that Garden Cruiser. In any case, even if he was, we sure did not notice each other! LOL! 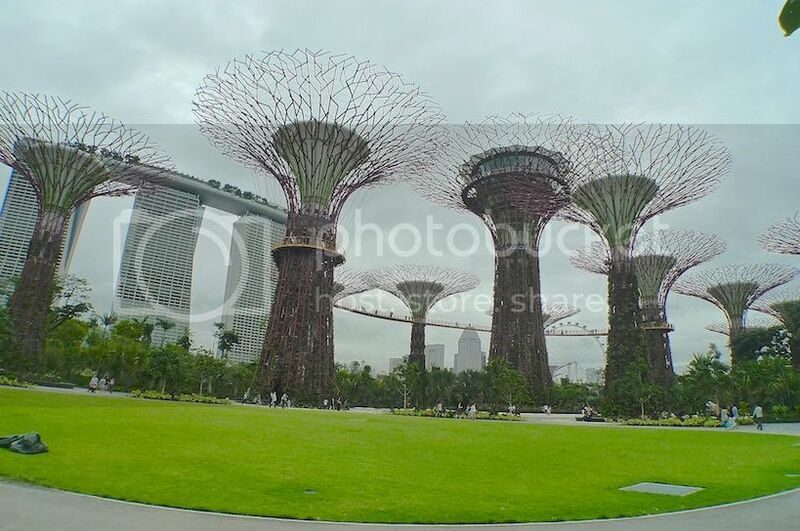 I did not know how long I wandered around the gardens but soon, I reached the Supertree Grove. 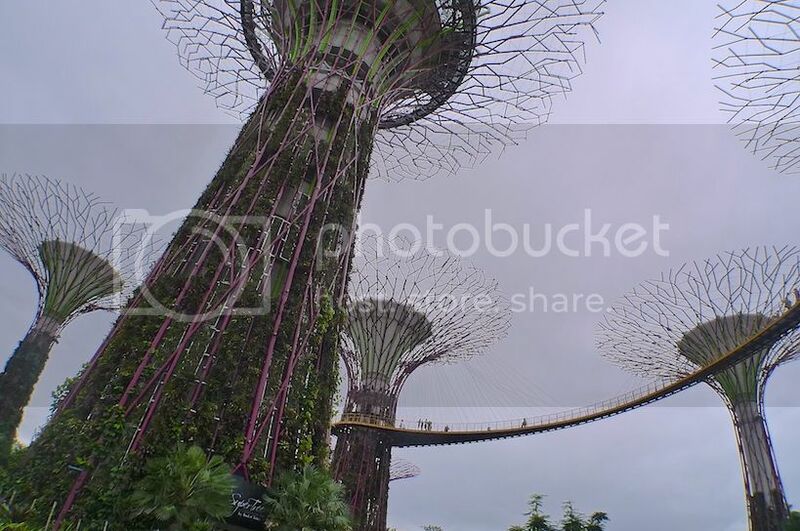 The Supertree Grove is where the cluster of uniquely designed tree-like structures called Supertrees stand. They dominate the Gardens' landscape with heights that range from 25 to 50 metres, or about 16 storeys high. 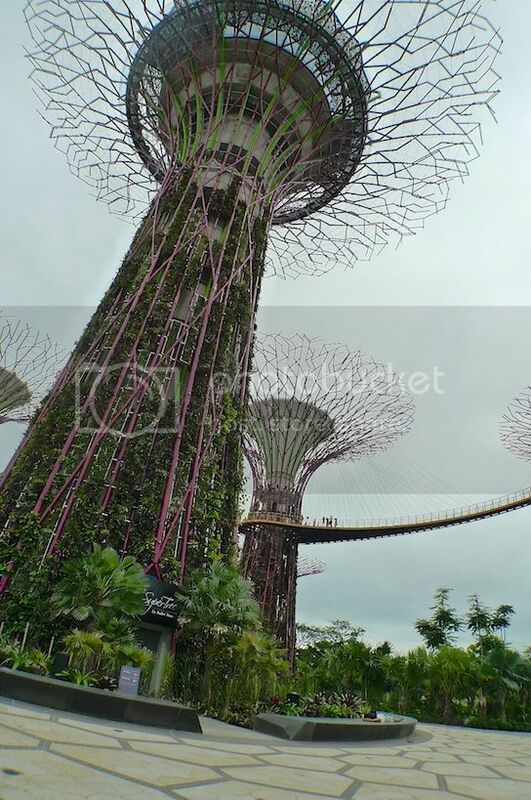 These Supertrees are also knows as Vertical Gardens as more than 162,900 plants comprising more than 200 species and varieties of bromeliads, orchids, vines, ferns and tropical flowering climbers are planted on them. 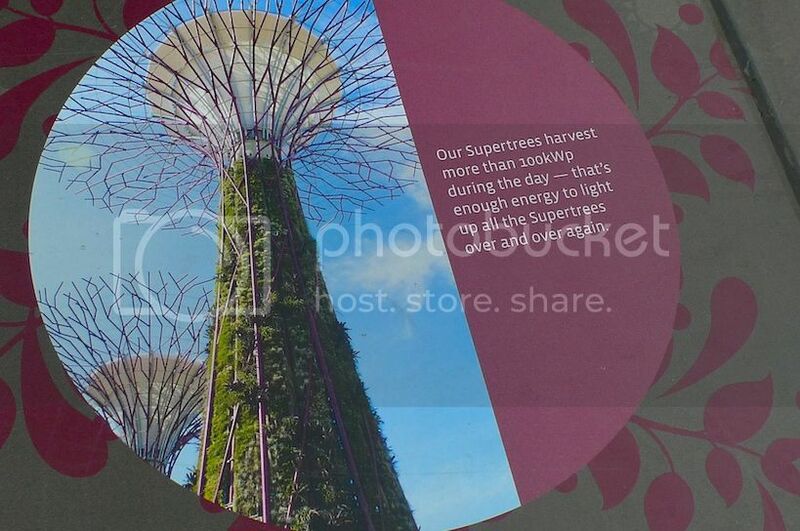 There are altogether 18 Supertrees in Gardens by the Bay, 12 of which are in this Supertree Grove area, 3 more at the Golden Garden and the remaining 3 at the Silver Garden. Refer to the map HERE. 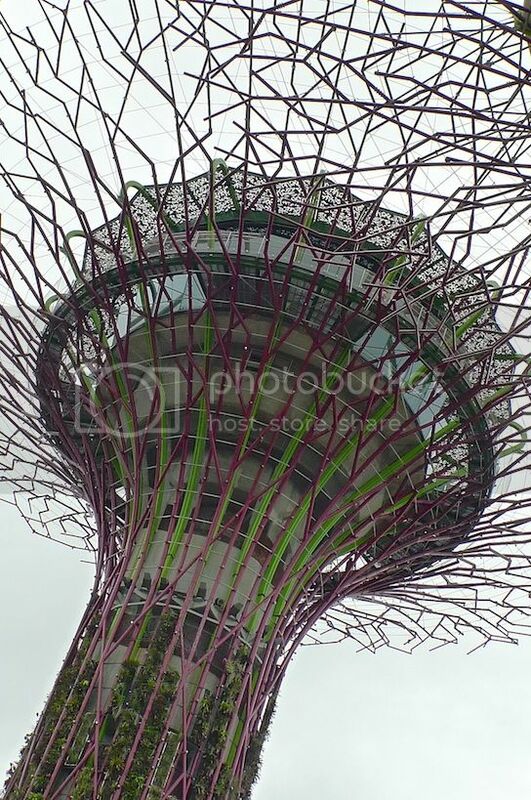 Did you know that these amazing Supertrees perform many functions? They are not built just to look nice! 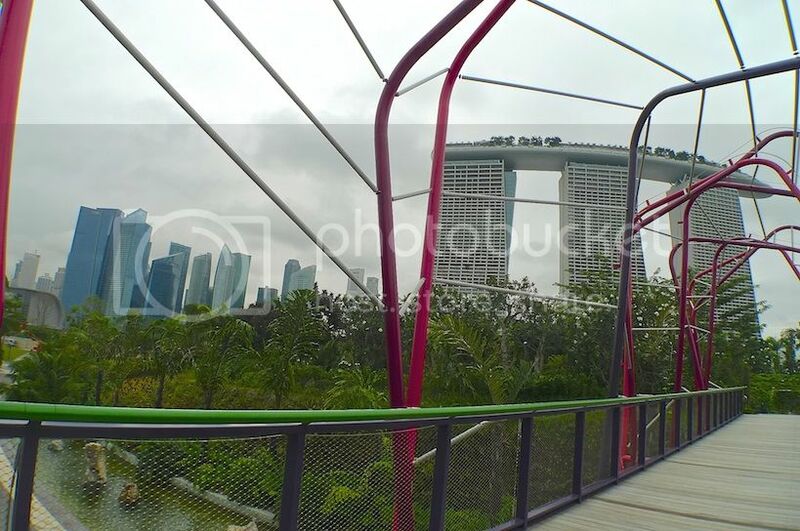 Besides providing scale and dimension to the Gardens, the tall trees also serve to balance the tall developments in the Marina Bay area. 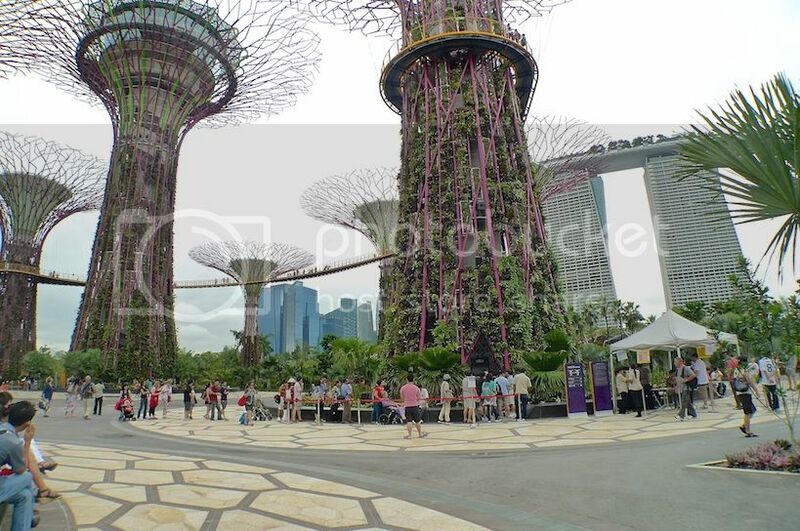 But the most amazing part of the Supertrees is that they are embedded with environmentally sustainable functions like photovoltaic cells to harness solar energy which are used for lighting up the trees at night! 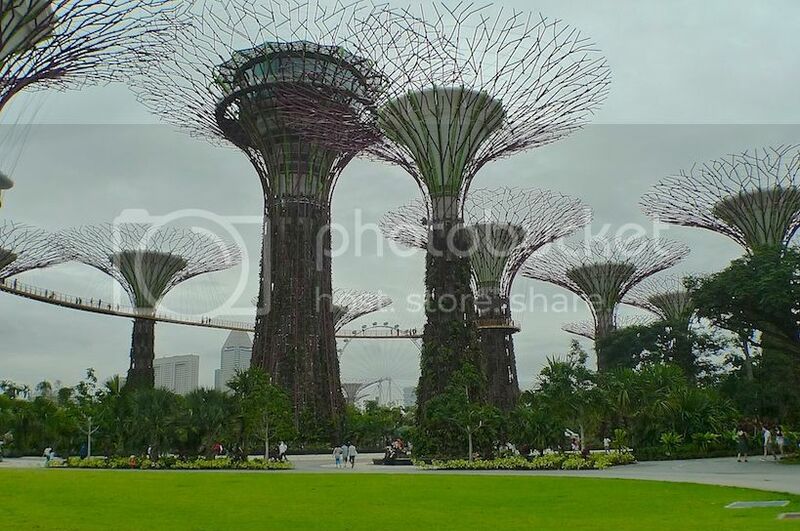 Not only that, the Supertrees also collect rainwater for use in irrigation and fountain displays in the Gardens, just like how real trees absorb rainwater for growth. Remember the Cooling Conservatories I mentioned in Part 1? 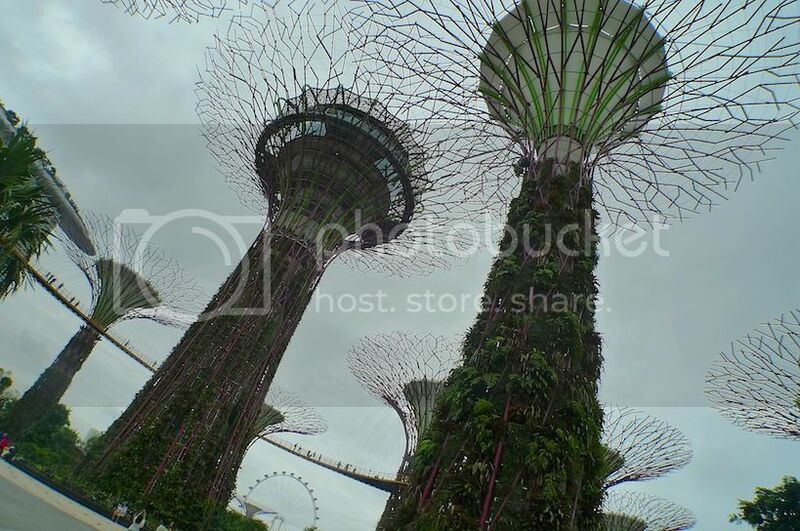 The two giant glass buildings which I visited later were cooled naturally with the help of the Supertrees. 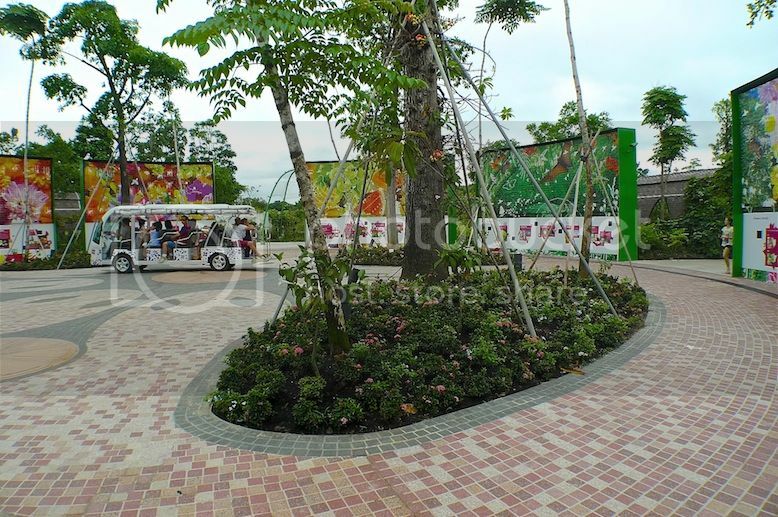 These trees are integrated with the Conservatories and serve as air exhaust receptacles. 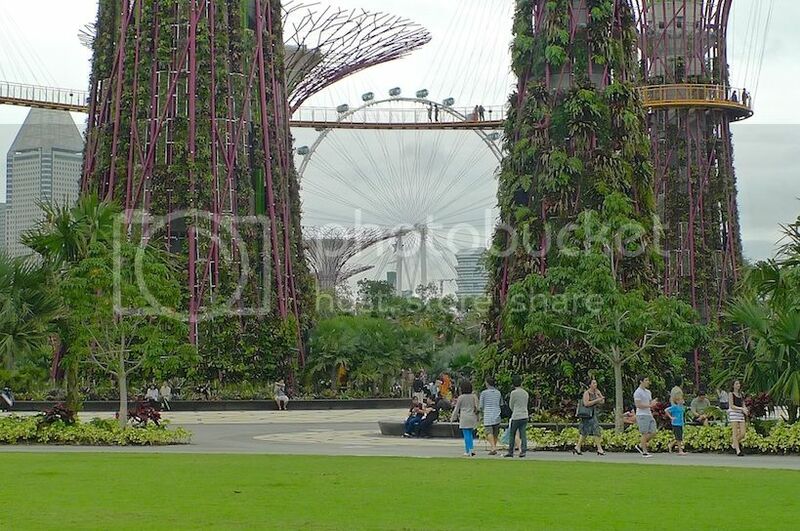 So as you can see, the Supertrees not only function as a vertical garden, providing shades in the daytime and lighting up the sky at night, they also work as environmental engines for the entire Gardens by the Bay. How awesome is that! 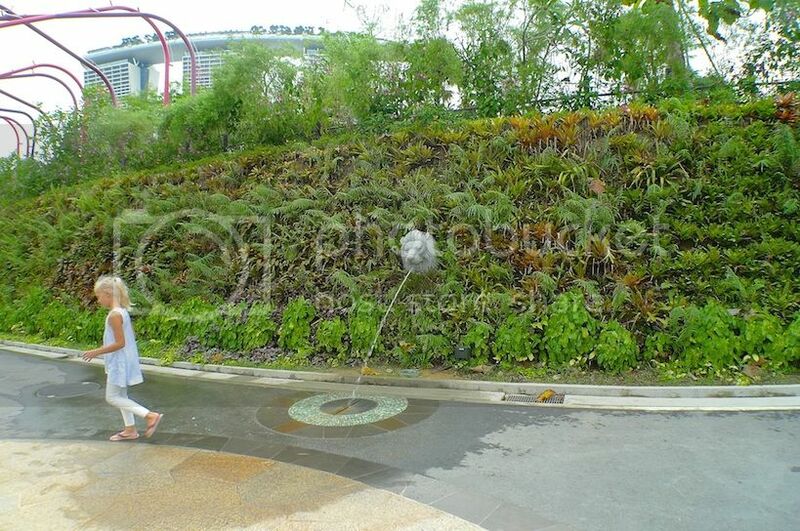 In fact, the whole Gardens by the Bay were designed with the principles of environmental sustainability in mind. This post will be way too long if I attempt to explain how it is all done. Perhaps this diagram below (please click to enlarge) can give a better illustration. Notice that even the lakes play a role in the whole grand scheme of things! You can read more about the important functions of the lake system HERE. 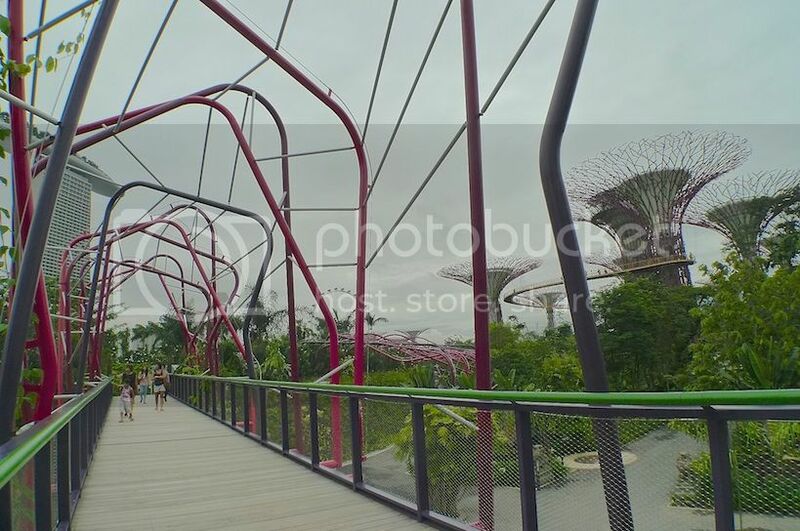 A 128-metre long elevated walkway called the OCBC Skyway connects two Supertrees at this Supertree Grove. I did not walk the Skyway as there was a long queue of people lining up for it! 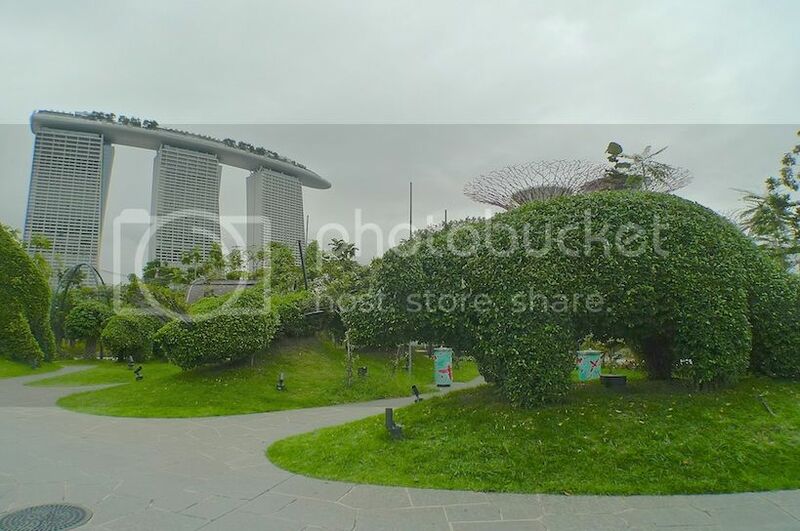 By the way, there is also a bistro on top of the highest Supertree where you can dine or chill out with unobstructed view of the Gardens and Marina Bay. I did not go up there but I definitely will do so on my next visit! 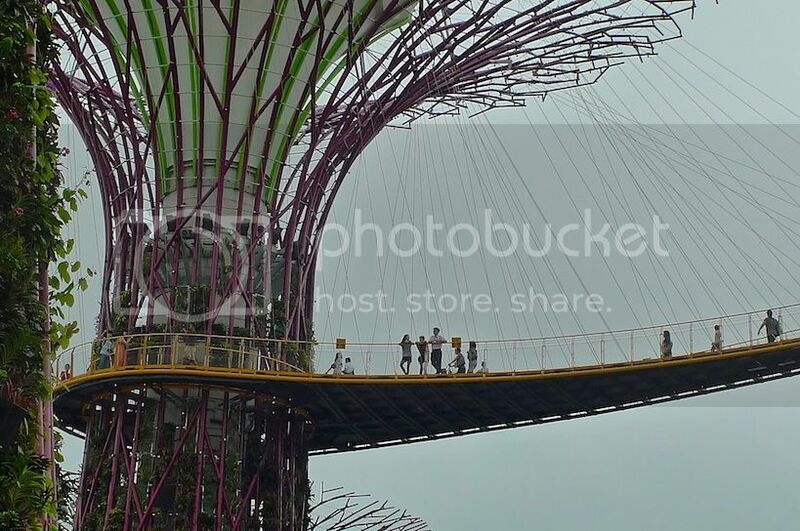 During the night, there is a spectacular music and light show at the Supertree Grove. 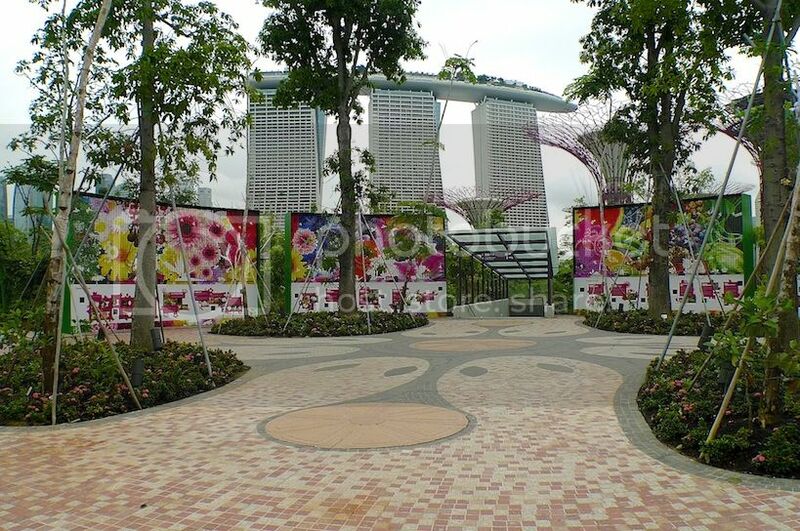 Called the OCBC Garden Rhapsody, this 10 minute show is shown twice every night at 7.45pm and 8.45pm. 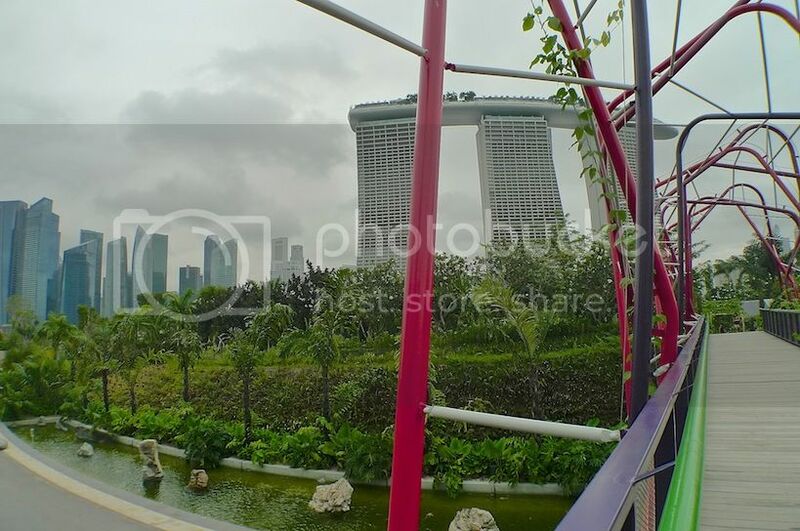 Since I did not go up the Skyway, I decided to head towards the Cooling Conservatories, which had came highly recommended before my trip to Singapore. 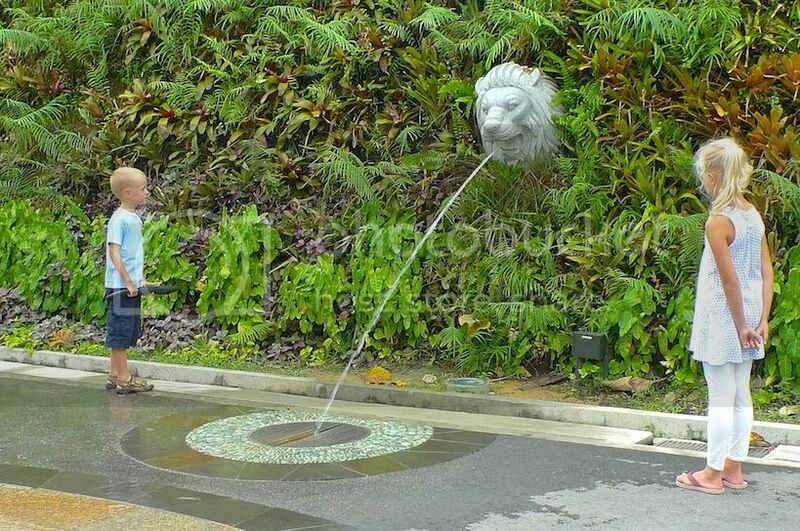 Along the way, I was fascinated by this water-sprouting lion head. I guess these two children were equally fascinated. 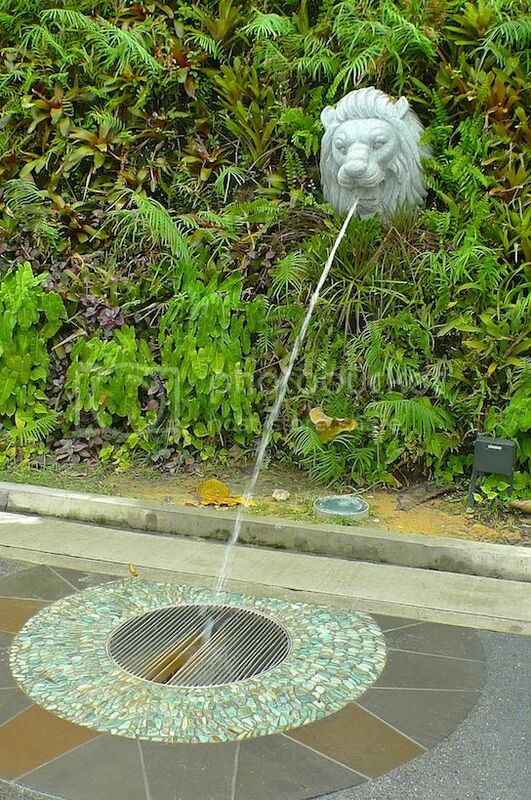 It was quite strange to see a lion head in the middle of all those plants and bushes. I thought it was a pleasant attraction especially for kids! I took a photo of the lion from another angle. Many people later shared my fascination and took photos of it too. LOL! 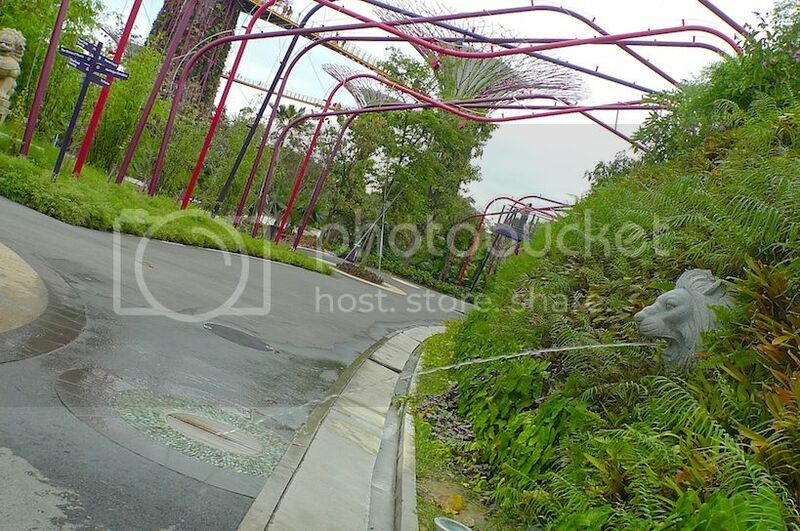 Leaving the Supertree Grove, I glanced back and saw two lion statues guarding the entrance. 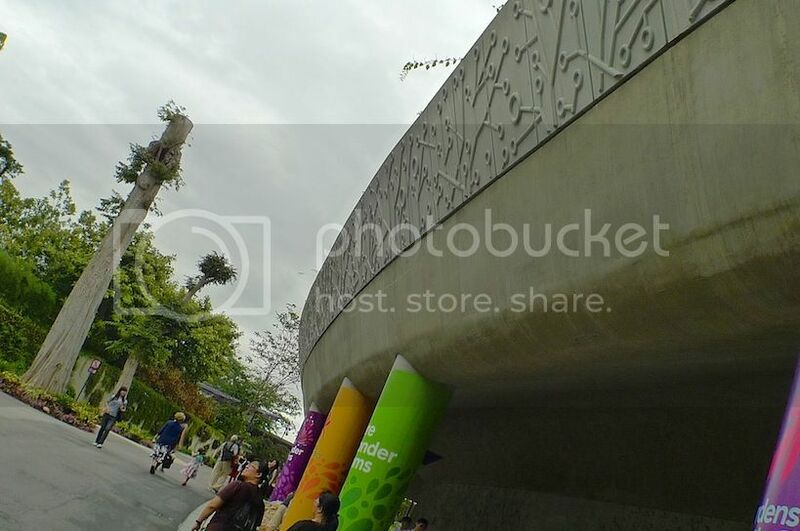 It had been a fun filled morning at Gardens by the Bay. 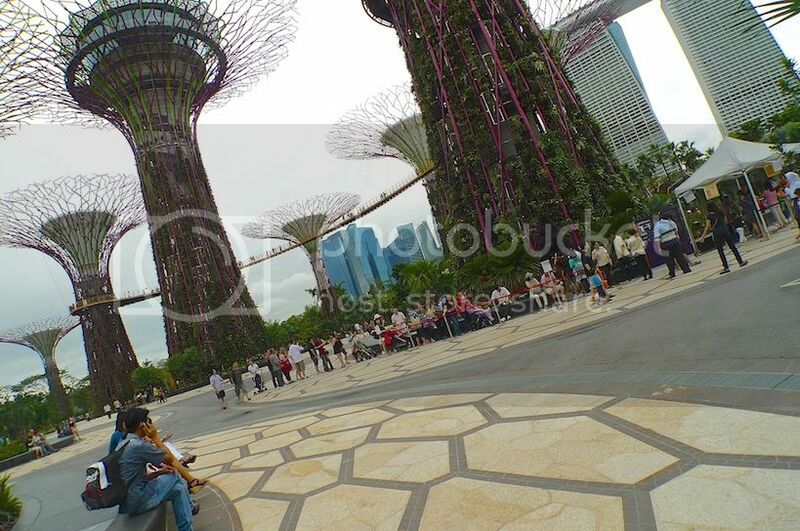 My only regret was not staying long enough to see the Supertree Grove all lighted up at night! I am quite sure it will be a very beautiful sight to behold. 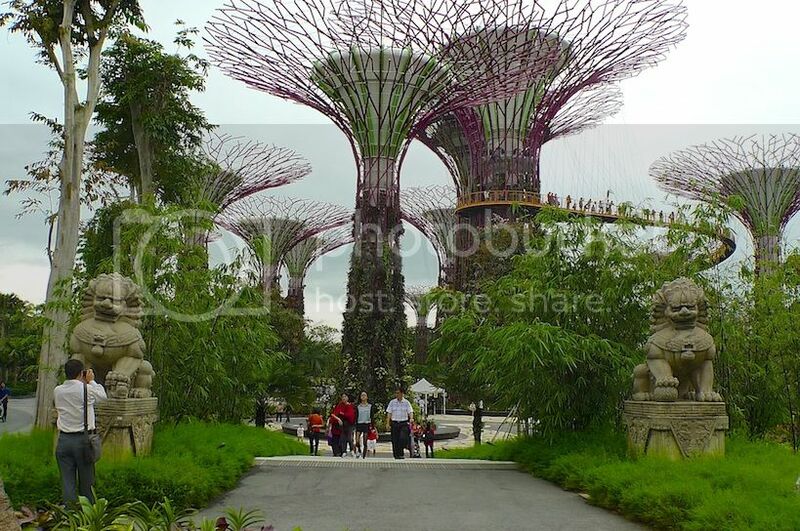 So yes, I will definitely return to Gardens by the Bay and spend the entire day here!